Angela Lynne Slate Mize of Buchanan passed away Monday, September 17, 2018 in a local hospital. She was born in Carroll County, February 15, 1964, daughter of the late John William Slate and Connie Corine Hulett Slate. 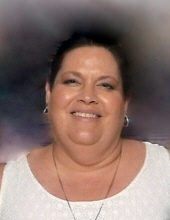 Angie worked as a nurse at Tanner Medical Center, Carrollton for twenty plus years. In addition to her parents, she was preceded in death by her husband, Darien James Mize. Survivors include three sons, Joshua and Kristi Mize, Caleb Mize, Nathaniel Mize and two sisters, Leslie and Brad Mizell and Patti and Mike Patterson. The family will receive friends at the funeral home Sunday from 1:00 until 3:00 PM. Services will be held Sunday, September 23 at 3:00 PM from the chapel of Hightower Funeral Home with Reverend Kevin McAdams officiating. Angela Mize was an amazing woman. She fought tooth and nail to defeat cancer. In addition to fighting her own battle, Angela was a cheerleader for others. She was the first to send a text when she knew you'd had a rough day or the first to say good luck for tomorrow. She was a silent giver. She offered compassion and caring through acts of service or small surprises for those she loved to find. One story she saw online had really touched her heart. A little girl named Ally Smith had been fighting childhood cancer. Angela and I had several conversations about how strong she was to fight through each test and treatment and still have a smile for the world. As a mother, Angela knew the toll it was taking on her family to stand by and offer a smile or to hold a hand when things were tough for Ally. She would say, "I think she's going to lick this. Look how strong she is, look how determined. You can just tell." One of the last memories I have with Angela is telling her that Ally had won and we watched the recording of her ringing the bell. Angela was so excited she couldn't sit still. "They need to go somewhere!" If you knew Angela, you knew she was a terrible travel bug. Europe, Alaska, Puerto Rico, Bahamas...she visited all those places and still wasn't satisfied. It didn't surprise me that she thought a trip would be the perfect way to celebrate. Angela was a big believer in surprises, travel and dreams. We would like to honor her in death as she was in life. In lieu of flowers, we would like to send Ally and her family on a much needed vacation. A time to celebrate the triumph that she worked and fought for, that Angie understood so well. Please help us give the gift of making a trip for this family.. From one warrior to another. To plant a tree in memory of Angela Lynne 'Slate' Mize, please visit our Tribute Store. "Email Address" would like to share the life celebration of Angela Lynne 'Slate' Mize. Click on the "link" to go to share a favorite memory or leave a condolence message for the family.